Dr Crionna Tobin explains how inter-county sides have evolved, and gives readers advice that they can apply to their own training. James McEntee of Meath, a team Tobin has worked with in the past. THE AREA OF nutrition in Irish sport has come a long away over the last decade. Having worked closely with top-level teams and athletes for 12 years, Dr Crionna Tobin has witnessed first-hand the enormous progress that has been made in terms of what those seeking elite performance put into their bodies. Former tennis star Conor Niland, sprinter Brian Gregan and long-distance runner Maria McCambridge, as well as the inter-county teams (hurling and football) of Dublin, Galway and Meath, have all called upon Tobin — founder of Fuel&Perform and head of science and nutrition (EMEA) at Glanbia — for expertise in the past. “The shift has been huge,” she tells The42, when asked about the significant growth in her industry. “When I started off, there wasn’t much respect given to nutrition. It was also thought that if you weren’t training to feel sick then you weren’t training hard enough, so a lot has improved since then. “Going into dressing rooms initially, it was much harder to get everybody to buy into it and believe that if they made even small changes to their nutrition and hydration habits it would positively affect performance. You were looking for players to cut out junk food, eat more protein or just simply come to training hydrated. “A few years back, it was about fuelling so you were loading players with energy for matches and competitions. Now, it’s not just about the training session, the match or the competition. It’s really about how do you make this person, who may be an athlete, as healthy as they can be. The healthier the person, the better they can perform in all aspects of life. 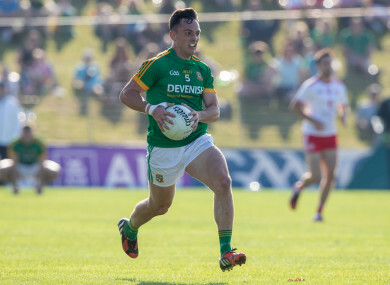 With most inter-county sides now possessing dedicated support systems and backroom teams, it has become increasing difficult to gain the extra edge that could prove the difference between winning and losing. You’re only as strong as your weakest link, and, as Tobin explains, the key to success is to ensure that all members of the panel consistently remain disciplined. “In a team environment, you would love to think that everybody is doing what you tell them but it depends on the commitment of the players,” she adds. Everyone thinks nutrition is about food but it is more about behaviour and habits, and that’s the challenge. We’d all love to have a take-away or a chocolate bar everyday but if this is your norm and this is what you choose to fuel your body with then you will get out what you put in, which in this case won’t be great. “That is why nutrition can quite difficult. Sports people and, particularly teams, are better now than they were 10 years ago as nutrition has earned its place at the table. Five, six, seven years ago, lads would go bananas in the off-season and they would put on two stone that would have to then be lost, whereas now they’re going on holiday but still watching what they’re eating and drinking, while keeping up some training. “There are different strategies you can use with sports people depending on their starting point. You begin with the basics by making sure they’re eating the amount of energy they need for their training. Then you see if they’re getting the right amount of protein daily and ensure some of that intake is timed after training to repair and recover after sessions. “You also need to make sure they’re consuming the right amount of carbohydrates. The funny thing is, when I started out it was all about pushing the potatoes and the pasta away from players. Away from elite sport, Tobin helps people who balance their everyday commitments with demanding disciplines like triathlons, while others simply want to be more active and improve their diet. “When I work with clients who have little interest in sport, or maybe they’re trying to do a couch to 5k, the biggest challenge, and it’s an age-old one, is trying to get them to not eat as much confectionery,” she reveals. Even though we’re bombarded with messages about protein and reducing your sugar intake, the average men and women are still eating a lot of treats. We’re in an environment where it is so readily available. “The first suggestion I would make is to cut out the junk food. A lot of people come to a nutritionist and think ‘She’s going to make me eat the food that doesn’t taste nice’, or ‘I’ll be starving’ but if you’re eating good quality food with lots of fresh veg and protein, you shouldn’t be hungry and you shouldn’t put on weight. If anything, it should be easy to lose weight. “There are so many recipes out there, I’ve got plenty on my website, and they’re just normal, good food. It doesn’t take that long once you’re prepared. People say ‘Oh, I don’t have time as I’m so busy’ but everyone is in the same boat. “You just have to make the time. Everyone has an hour but it might be whether you want to watch another episode on Netflix or you want to prepare a couple of meals for the week. It takes hard work, ambition and nutrition to be a high-performance athlete. Avonmore Protein Milk has added 50% extra high quality whey and casein protein – as well as being low in fat, and a source of calcium, vitamin B12 and vitamin D. Try it for breakfast, lunch, tea, after training… any time you like. #YouveGotThis. Email “The sports nutrition powering top teams (and how to use it yourself)”. Feedback on “The sports nutrition powering top teams (and how to use it yourself)”.